David Nadien is an American violinist and teacher born (in Brooklyn, New York) on March 12, 1926 (Heifetz was 25 years old.) He is best known (perhaps somewhat unjustly) for his recordings for the Suzuki Violin School. He began his violin studies as a child and his father (a bantamweight champion boxer) was his first teacher. He also studied with Adolfo Betti (Mannes School of Music) while very young and moved on to Ivan Galamian (Juilliard) and Adolph Busch later on. In 1938-1939 he studied in Italy with Betti. He returned to the U.S. after war broke out in Europe and made his debut with the New York Philharmonic in 1940, at age 14. Four years later, having been drafted, he was playing in the Armed Services Orchestra. Two years after that he won the Leventritt Award (1946 – for this, some give credit to Arturo Toscanini and others to George Szell.) He concertized for a while after that but soon settled into a career which involved lots of studio work (and, in fact, he even became a contractor, hiring studio musicians of very high caliber to play for recording sessions.) Nadien is said to be one of the best sight readers in the world, a skill which is invaluable for studio work. (Franz Clement was also phenomenally gifted when it came to sight reading.) A persistent rumor has it that Isaac Stern was able to shut down Nadien’s concertizing career, though the rumor might be baseless. In February of 1966, Nadien auditioned (having received an invitation to audition) for the concertmaster’s position in the New York Philharmonic, of which Leonard Bernstein was then chief conductor. It has been said that he easily beat Joseph Silverstein (of the Boston Symphony) and 40 other candidates. He had never played in a major symphony orchestra before. Upon accepting the job of concertmaster, his annual income actually decreased. Very soon into his first season with the orchestra, on October 8, 1966, Nadien played the Tchaikovsky concerto as the orchestra's guest artist to great (and memorable) acclaim and subsequently soloed with the philharmonic on several occasions. The New York Times said: “Mr. 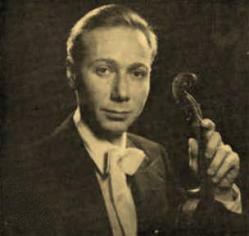 Nadien’s style, tone, and technique are perfect.” Many have said that his vibrato and sound (“pure, silken, suave, razor-sharp and rhythmically-driven”) are unique and that at least some of his vibrato actually emanates from his fingertips, very much like Mischa Elman’s. (Coincidentally, as was Mischa Elman, Nadien is also of very short stature.) It is highly interesting that Oistrakh and Menuhin are among those who sought Nadien out for advice on technique at that time. He left the Philharmonic job in 1970 and returned to studio work, solo appearances, and teaching. One of his outstanding performances after that took place at New York’s Town Hall on January 17, 1973. His discography (outside of the anonymous world of the recording studio) is small but includes the Beethoven, Brahms, Mendelssohn, Tchaikovsky, and Glazunov concertos, apart from several miscellaneous violin works (Zigeunerweisen, Havanaise, Tzigane, etc. ), all of them available on the internet. There are a few videos of his playing on YouTube. A reviewer has stated that Nadien “has by now gleaned a cult-like status among cognoscenti who savor marvelous fiddlers.” An interview of him on DVD is also available. He was on the faculty of the Mannes College of Music for many years but is no longer there even though he might be teaching privately. Nadien’s violin was a Guarneri del Gesu but I don’t know if he still owns it. Peter: Your comment nailed it as to why Nadien has a cult-like following. May I assume you are a violinist? Thanks. .
you guys know if he teaches in some school? or if he gives private lessons? Most Dangerous Orchestra in the World?